Normandy is a region in the northwest of France with a coastline of chalk cliffs and beaches. A rolling countryside with pastures and orchards makes cheeses and apples its main area of gastronomic specialties. Neufchâtel, Camembert and Boursin hail from Normandy, and its cream and butter are of superior quality. On the orchard front, its cider, perry (pear cider) and pommeau (a mix of apple juice and apple brandy) are renowned. However, it is Calvados, an apple cider brandy, that is a Norman specialty and warrants an appellation contrôlée. Cider brandy may be produced elsewhere, but it will never be a Calvados. What makes this gateaux aux pommes a signature Norman dessert are apples, cream, and surely, Calvados ;) And the addition of a topping batter, almost halfway into the baking time. These two are what separates the Normandy rendition of the apple cake from all others. Why the topping batter? Only after I tried this fabulous apple concoction did I understand that this cake produces layers of amazing textures. The bottom layers of sliced apples have softened and melded into the dense and moist part of the cake. The middle of the cake, where most of the batter sits is smooth and cake-y, as we know cake to be. And the top is where it shines. 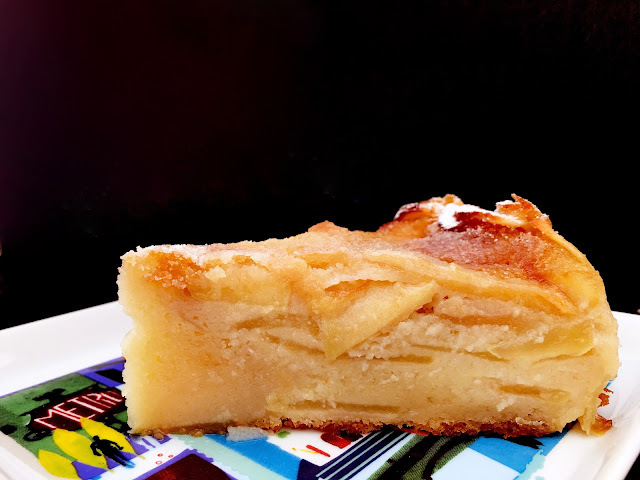 The apple slices sitting on the cake have crisped just enough to provide a bite, and the add-on batter nestles these slices with the softest lightest part of the cake yet. It is most definitely a cake you can make to impress. In lieu of apple brandy, you can use 'just' brandy, cognac or a golden rum. The liqueur is what gives this cake a fabulous aroma and depth of flavour. I chickened out on the flambéeing, opting instead just to pour the brandy liberally on the apples. (Our smoke alarm is very very sensitive ... ahem!) To compensate, I drizzled more Calvados on the top after the cake has cooled. You should too. 1. Butter and flour the sides and bottom of a 22 cm or 9-inch springform pan. 2. Heat the butter and sugar on a large fry pan. 3. When the sugar is melting, carefully place the sliced apples and cook for 3-5 minutes until slightly softened, or barely pliable. 4. Remove from heat and set on a trivet on the countertop, away from the stove. 5. In a small bowl, whisk together the 125g flour, 180g sugar, baking powder and salt. 6. In a large bowl, whisk the 2 eggs, cream, milk and vanilla. 7. Fold the dry ingredients into the large bowl, stirring just enough to remove the lumps. 8. In the now empty small bowl, whisk the topping batter: 1 egg, 2 tbsp flour and 1 tbsp butter, to combine. 9. Preheat the oven to 180C or 350F. 10. Line a baking sheet with parchment paper to set the springform pan on. 11. Place a layer of sliced apples around the pan. 12. Pour a ladle-full of the batter onto the pan, then place a layer of sliced apples on top. 13. Ladle another layer of batter, followed with more apples, and more batter. 14. Reserve the best looking apple slices for the top of the cake. 16. Remove from the oven and pour the topping batter from the small bowl on top of the cake. 17. Sprinkle with the 1 tbsp of sugar. 18. Return to the oven and bake a further 35-45 minutes until a skewer comes out clean. 19. Set to cool on a rack, still in the springform pan. 20. When cooled, drizzle the Calvados on top, cover with cling film and refrigerate until ready to serve.